If you’ve ever set up an automatic ‘Bill Pay’ feature on your bank account to pay off your utility and cable bills, then you’ve taken advantage of a nifty feature called an ‘interbank transfer’, also known as an ‘Automated Clearing House’ payment. Once they’re set up, they tend to be very convenient — the amount of the bill is automatically deducted from your account, saving you the hassle of having to write yet another check (or fill out another online form) each month. Merchants benefit from this system as well, because their fees are significantly lower than those that are charged by the credit card companies. Thing is, this feature is typically only available for paying bills from big companies — it’s rare to see a smaller online merchant that’s offering these automatic transfers, because the process for them to set it up is complicated and costly. Until now. Y Combinator -backed startup GoCardless is launching today as a UK-based service that allows smaller merchants to easily set up interbank transfers for customers. Part of Y Combinator’s Summer 2011 class, GoCardless was founded in 2010 by Oxford graduates Hiroki Takeuchi, Tom Blomfield and Matt Robinson. GoCardless is also announcing a $1.5 million round led by Accel Partners, Passion Capital, SV Angel, Start Fund, and Y Combinator. Proceeds will go towards building out the team and product, and expanding the merchant base. The service is offering a REST API that allows smaller merchants and companies to easily integrate these automated transfers into their sites for one-time and recurring payments. By bypassing the credit card network, GoCardless is able to offer the service for one-third to one-fourth of the cost of most network-based payment options — the fees charged are around 1 percent (but will never reach higher than 2₤ per transaction, no matter the amount). As the startup explains to me, interbank transfers are commonly used in the UK and Europe to pay bills from giant companies, like your gas or phone bills. But each of these payment applications had to be custom-developed by a consultant, and negotiated individually with each bank — which is an impossible task for most small businesses. GoCardless has spent the past year speaking and negotiating with banks, doing all the requisite legwork for broad approval. And, aside from the lower fees, another advantage of interbank transfers is that merchants don’t need to worry about credit cards expiring (which is a huge problem with recurring or subscription payments) and there is no need to deal with PCI compliance. For consumers, GoCardless makes it quick and easy to make payments. 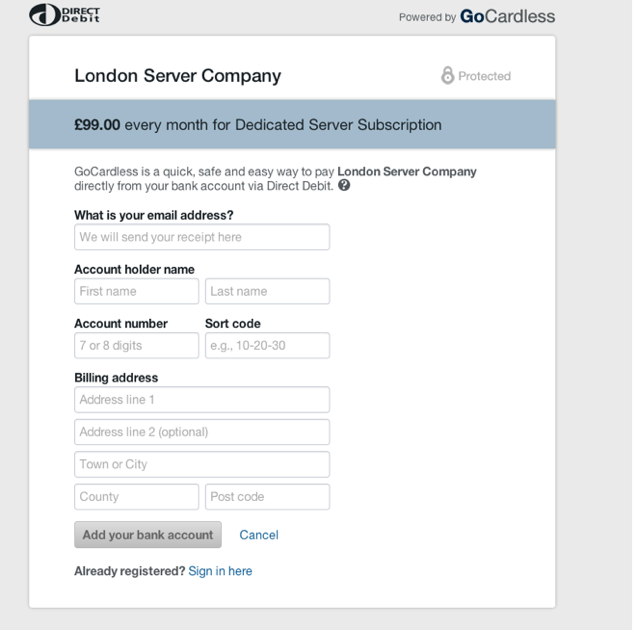 After the initial sign up, users can authorize future payments anywhere GoCardless is offered with just one click. The company has also created a dashboard where users can easily manage all of their payments made via their bank accounts, giving them more control over their online spending. Since launching a beta product in late 2011, GoCardless has already integrated with over 300 merchants and is growing quickly. 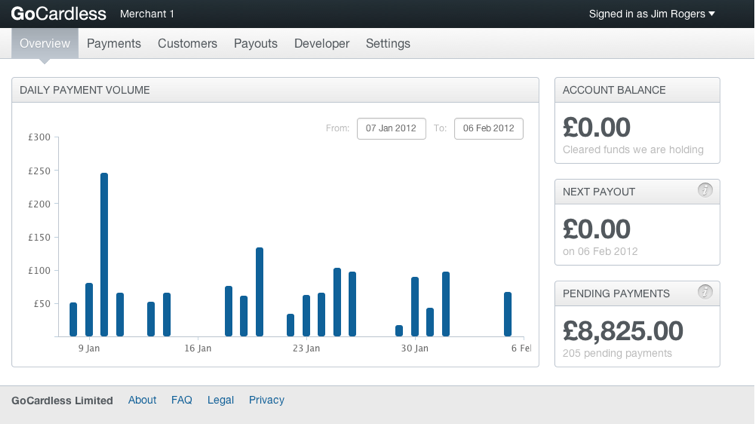 The startup has over 1,000 merchants in the UK who are on a wait-list. For example, Kashflow, an online accounting service for SMEs, integrated with GoCardless to help its customers collect money. Other users include SaaS companies and those who charge for digital content. Interestingly, Dwolla is also doing something similar in the US, allowing an easier way to accept payments (and reduce fees) for merchants. One advantage GoCardless has in its favor across the pond is that it is fairly commonplace to pay via interbank transfer in the UK when it comes to major company bills.